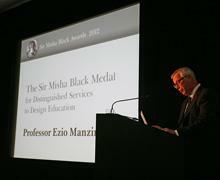 “It’s my great pleasure to introduce the recipient of the 2012 Sir Misha Black Medal for Distinguished Services to Design Education, and to say a little bit about why Ezio Manzini is such a worthy winner. Italy may be the land of elegant, mass-produced design, but Ezio Manzini is most definitely a one-off. We can describe him as a designer, engineer, architect, author, and outstanding educator. And all of those things are true – a real renaissance man. But above all else, he is one of the most important critical thinkers in design today. Our constant guide through globalisation, our chief interpreter of how the world is changing, and our design conscience on making it a better place. In keeping with the sinuous shapes of Italian design, Ezio’s academic career has followed a kind of seductive S-bend. He first came to international prominence as Professor of Industrial Design at the Polytechnic of Milan in the 1980s, talking about the Surface of Things – who could forget his memorable book, The Material of Invention, an indispensible primer for product designers everywhere? Then in the 1990s came Strategic Design, followed in the new millennium by a focus on Service Design, Sustainability and Social Innovation. So, all the S’s. Where Ezio leads, the rest of us follow. You could say he’s always ahead of the S-curve. That message about creativity and entrepreneurship he has given to generations of design students, not only in Milan, but all around the world, and especially in China where his influence is now keenly felt. From the San Siro to Shanghai, from the Domus Academy, where he was once director, to Tongji, Ezio Manzini is now carrying the torch for a whole new type of socially engaged design. One capable of ‘scaling down’ to meet real local needs as well as ‘scaling up’ to address big global challenges. ‘Before (in the good old days) if a person liked killing people, he had to become a general, purchase a coal mine, or else study nuclear physics. Today industrial design has put murder on a mass-production basis. By designing criminally unsafe automobiles that kill or maim nearly one million people around the world each year, by creating whole species of permanent garbage to clutter up the landscape, and by choosing materials and processes that pollute the air we breath, designers have become a dangerous breed.